From left are Auxiliary President and Bazaar Co-Chair Julie Burns and Linda Tyrrell, owner of Harbor Towne Gifts and Souvenirs. 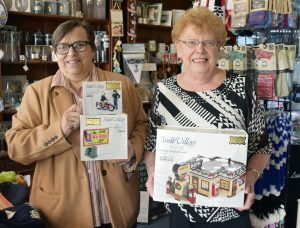 OSWEGO – Harbor Towne Gifts and Souvenirs, of Oswego, has once again made a donation to the Oswego Health bazaar. The local business has Snow Village’s three-piece Harley Davidson roadside motel. Tickets to win the holiday decorations will be available at the bazaar to be held from 9 a.m. to 7 p.m. October 10 and 11 in Oswego Hospital’s front lobby. The bazaar will also include complete turkey and ham dinners both nights from 5 to 7 in the Oswego Hospital cafeteria. The cost of the dinners are $11 for either takeout or eat in, $6 for kids age 12 and younger and free for those age four and younger.